Any chance anyone knows a quick fix to get those Flameguard's sorted out? 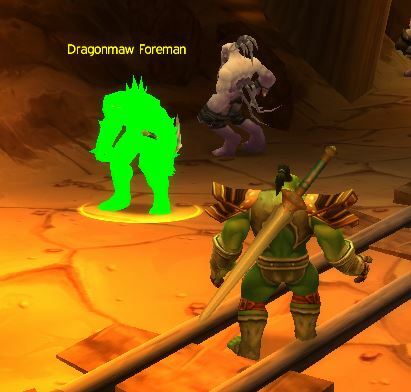 The issue is with the Dragonmaw Foreman (Display ID: 21441) located in the Netherwing Mines. Hey, looks so that it could be a missing baked texture or a wrong file path in the CreatureDisplayInfoExtra. It also could be that the id in the creaturedisplayinfo is wrong and linked to something in the CreatureDisplayInfoExtra what wants a texture that not exist. I cant say what exactly make the issue, because you use my,the goblin and Leeviathans mod and im not sure what there is new or different. I looked in the log of WMV and found that it was referencing this texture which isn't in any of the patches. PS - If you delete the model reference the client will crash, so I just put a replacement in. I think this error could stem from the fact that this NPC had a bugged texture in Patch 6.0. It was supposedly fixed in 7.03. Another interesting thing is in WMV the texture shows a bugged texture on the model with a miner's headlamp. In one of the bugged retail screenshots the NPC has a blue cube on its head which I'm guessing is the missing miner helmet. Anyway.. fixed and moving on. Sorry for Offtopic. Where I can find Cata Trees patch ? It's only which I'm missing. Hello your work this great friend, I wonder if to remove a version for cataclysm since it would be great. I probably won't release a version for Cataclysm, I have to pick a place to stop or else I'll be doing this forever. I could share the pre-retroported models with anyone that wants them though. That would be great, it hurts that I do not know how to make the patches and everything custom.